Activists on Freedom Flotilla ships have put on life jackets as Israeli navy approaches at around 4PM Eastern. The flotilla remains in international waters outside an exclusion zone which Israel has already extended from 20 to 68 miles. The flotilla is still 120 miles from Gaza. 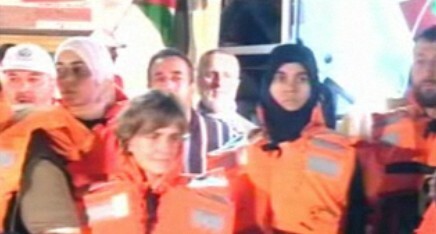 The largest contingent of activists on board the Freedom Flotilla comes from Turkey. Turkish Prime Minister Recep Tayyip Erdogan said that the convoy of ships, including Turkish ships, carrying aid to Gaza was just a move of non-governmental organizations and had nothing to do with Turkish government. “It is also an international move of the civil society. It is completely a step taken with humanitarian purposes,” Erdogan told reporters in Brazil. “I think there will not be any problem if Israel shows a humanitarian stance to this humanitarian aid,” he said.